Jamaica dominated the XXIII Central American and Caribbean Athletics Championship, Mayagüez 2011 and finished tonight with 10 gold medals, 6 silver, and 10 bronze. 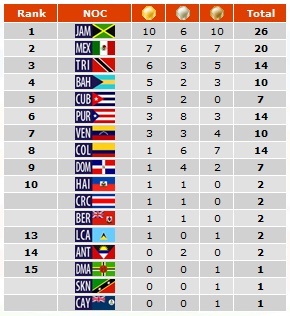 Mexico is next in the medal tally (with 7 gold prizes) and Trinidad and Tobago follows (with six first places). Of the 36 participating countries, 17 didn’t obtain any medals, while Cuba, with a reduced delegation of 9 athletes, managed an honorable fifth position with five gold medals. Puerto Rico finished sixth with three.